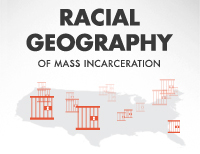 First national article to explain prison-based gerrymandering is still timely. 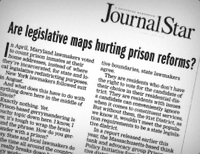 The first major national article about prison-based gerrymandering appeared ten years ago today. Jonathan Tilove, then the race and immigration reporter for Newhouse News Service, wrote a major feature that connected the dots between my academic research on how the Census Bureau’s prison counts distort democracy in the New York State legislature, Taren Stinebrickner-Kauffman’s research on prison demographics in Florida, and the redistricting struggles of county officials in Colorado, Louisiana and Florida. To quote from Jonathan’s article, at the time the “issue [hadn’t] gained much serious attention or debate at the national or state levels.” But the article changed all that. Prior to Jonathan’s article, explaining my research used to take hours. His piece helped us succinctly explain who benefits from prison-based gerrymandering. For example, in a single clear sentence Jonathan powerfully summarized one concept that used to take me 15 minutes to explain. Many of the innovations in Jonathan’s article informed how we constructed our “Importing Constituents” report, and Jonathan’s discussion of intra-rural impacts inspired our strategy for the next decade. The article’s publication introduced our work to Brenda Wright, then managing attorney at the National Voting Rights Institute, and now Director of the Democracy Program at Demos. Brenda reached out to share her expertise and has been one of our closest advisors and colleagues ever since. There’s been great progress since 2002, but the article is still a concise introduction to the problem, and a powerful explanation of how the Census Bureau’s prison miscount is bad for both urban and rural people. In Iberville Parish Louisiana, prison-based gerrymandering would have meant drawing a school board district that had only two voters. In the New York Senate, legislators who supported prison expansion boasted that they were glad that people incarcerated in their districts couldn’t vote because “they wouldn’t vote for me”. Ten years ago, prison-based gerrymandering was virtually unknown. The issue was intriguing but complicated and obscure. Jonathan Tilove’s article was the first to focus on this problem and to give the public the tools they need to understand why prison-based gerrymandering needed to be abolished. If you missed his article ten years ago, or if you haven’t read it again recently, today is a great time to read it again. Census miscount of prisoners skews legislative power across nation, but states can adjust Census data to use actual resident populations in redistricting.